Working closely with patients, nurses and doctors, ultrasound technicians obtain and analyze diagnostic images in medical fields ranging from cardiovascular to musculoskeletal to obstetrics. Also known as diagnostic medical sonographers, ultrasonographers, and ultrasound technologists, these professionals play a crucial role in the healthcare system. With a relatively short education timeline for entry-level positions and plenty of room for career advancement, ultrasound technician roles are becoming increasingly desirable. The U.S. Bureau of Labor Statistics projects that more than 27,000 new ultrasound technician jobs will be added between 2014 and 2024 (24 percent growth). The following guide brings together a wealth of resources, ranging from information about educational options and financial aid to career advancement prospects and student resources. For aspiring ultrasound technicians and sonographers, there are countless certificate and degree options offered both online and at traditional brick-and-mortar campuses. 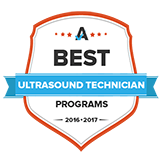 Rather than wading through an entire listing of options, browse our rankings of the best ultrasound technician programs for 2016-2017. Our ranking was compiled based on how schools scored on a number of different criteria, including tuition costs, graduation rates, student-teacher ratios, and the number of different programs or specialties available. Tulsa Community College's Owasso campus offers an associate in applied science degree in diagnostic medical sonography which is part of their Workforce Development program. This program allows students to transition directly into a career upon graduation in this quickly expanding field. In addition to classroom education, students work at various medical facilities in the surrounding Tulsa, Oklahoma area to gain experience and knowledge in order to create sonographic images for medical diagnoses. Campus life includes many events and activities promoted by the college's clubs and organizations. Scholarships, grants, student loans, and work study programs give students the needed financial resources for a successful education. With a growing demand for skilled sonographers, earning an associate's degree in diagnostic medical sonography from Hinds Community College in Mississippi puts students on the path to a successful career. This profession includes general and cardiac sonography, vascular technology and other specialties, working under the direction of a radiologist or physician. With tuition rates that are less than half the cost of in-state four year universities, education is affordable. Students also have access to scholarships and federal student aid by filing the Free Application for Federal Student Aid. In addition, the college offers more than 90 clubs and organizations to help engage students. Obtain an associate of applied science degree in medical sonography from Pitt Community College of Greenville, North Carolina in as few as five semesters. Curriculum includes physics, cross-sectional anatomy, as well as abdominal, vascular and obstetrical/gynecological sonography. Students learn how to process, use the equipment, about fetal growth and development, and patient care. Successful graduates are eligible to sit for exams for national certification. The college has many academic support services including TRiO, that gives students one-on-one support, counseling, tutoring, mentoring, and cultural enrichment activities. Federal student aid is available to all students and they are a military friendly school. Cincinnati State gives students a high-quality Associate of Applied Science degree in two diagnostic medical sonography fields, cardiovascular and general imaging. Students will participate in classes and three clinical internships over the course of the three-year program. The internships can be done at any of the college's seven clinical sites around Cincinnati. Classes are generally offered between 8 am to 5 pm Monday through Friday and teach students patient care skills, medical law and entry-level sonography for multiple medical fields. Students who complete the program with a 2.75 GPA or higher can take the American Registry of Diagnostic Medical Sonographers exam and begin work in the medical field. Jones County Junior College works to provide quality education and community resources. Two diagnostic medical sonography programs give students options to receive an Associate of Applied Science or Technical Certificate of Completion. Entry requirements require students to be current Radiology Technologists, have completed a four-year college program, or a two- year allied health program. The AAS is a two-year program, while the certificate takes only one year. Each program has a full-time summer semester requirement where students participate in a sonography seminar and experience a clinical setting. Students who complete the program may take a licensing examination and work as a licensed sonographer. With learning facilities in five counties, Weatherford college educates thousands of students from Texas, 32 other states and 23 foreign countries. Their diagnostic medical sonography program is just one of many degree offerings and prepares students for jobs as entry-level sonographers. The 22-month program consists of 65 credits of classroom, laboratory and clinical work. The program is built for full-time students and requires five days of coursework each week from Monday to Friday. Students who have completed the program can continue their education and receive a two-semester echocardiography certificate. Since 2012 , every program graduate has received a job within one year of completion. One of 26 community colleges in Alabama, Lurleen B Wallace Community College offers an Associate of Applied Science degree in Diagnostic Medical Sonography. Students must complete 27 credits of general course work before being accepted into the program. The full-time program begins in the fall and is structured to be completed in four consecutive semesters including a full load of summer coursework. Students learn the basics of both abdominal and obstetrical and gynecological sonography through a mix of class work and preceptorships with working medical professionals. Graduates have the opportunity to receive licensing 60 days prior to graduation and find jobs as registered sonographers. Lone Star College prides themselves on their small class sizes and six campuses in and around Houston. Two Associate of Applied Science degrees are offered in diagnostic medical sonography. The first, echocardiography, is designed to prepare students for jobs as cardiac sonographers. While the second teaches students the fundamentals of abdominal and gynecological/obstetric sonography. Four prerequisite classes must be completed before entry into the program, followed by 60 additional credits over two years. Clinical and classroom course work are required as well as three practicums. Students who complete the program then take a credentialing exam to receive licensing. At Delta College in Michigan, potential students interested in diagnostic medical sonography can earn either an advanced certificate or associate's degree in applied science. Enrollment is limited to 14 students each year, ensuring small class sizes and personal attention from instructors. The medical sonography program focuses on teaching the problem solving and technical skills necessary to provide quality patient care. Students are encouraged to practice skills they learn in the campus health lab, where manikins and state of the art equipment provide reinforcement to theories studied in the classroom. Potential applicants should familiarize themselves with prerequisites required for admission to the program. Students seeking an associate degree in applied science in diagnostic medical sonography will find a quality, CAAHEP certified program at Lansing Community College in Michigan. The college accepts 20 to 24 students in the diagnostic medical sonography program each year, and the curriculum is 15 months in length. Coursework includes clinical site work at a variety of hospitals and clinics. Single parents can apply for assistance with the Women's Resource Center, regardless of gender. Students are encouraged to participate in job shadowing to gain a professional perspective of the field and have the option of attaining the vascular certification. El Centro College in Dallas, Texas has a comprehensive and intimate diagnostic medical sonography program, offering an associate's degree in applied science. The program is CAAHEP certified and enrollment is limited to ten students a year, ensuring a low instructor to student ratio. Students graduate from the program with well rounded technical skills due to experience from clinical rotations at a variety of institutions, from a children's hospital to a stint in obstetrics. Additional training is available in the ultrasound scanning lab on campus, which contains a variety of modern equipment. Scholarships may be available upon admission. Pueblo Community College in Colorado has a radiologic technology program at both its Pueblo and Durango campuses. The radiologic technology program offers an associate's degree in applied science. It is two years in length, consisting of five semesters and 77 credit hours. The program class size has an average of 23. Students in the program are trained in a variety of imaging modalities such as sonography, nuclear medicine, bone densitometry, mammography and radiation therapy. The Pueblo campus has an energized, modern lab where students get experience for their clinic rotations on the same equipment they will use in a professional setting. Cosumnes River College in Sacramento, California is a great place for medical professionals to gain new experience with the diagnostic medical sonography program. Applicants must have an associate's or bachelor's degree and 1600 hours of direct patient experience before considering this program, as it is not an entry level program designed for first time medical students. The diagnostic medical sonography program offers both an associate in applied science and a certificate in diagnostic medical sonography. Students are required to agree to a full-time, two year commitment. Clinical experience and coursework provide the training as a professional in this dynamic field. The Sonography program at Red Rock Community College prepares students for entry-level positions in the field. Classroom courses are supplemented with hands-on lab instruction in our lab at the Arvada campus. In addition to classroom courses, there is a clinical component that gives students the opportunity to work with actual patients. The Sonography Program at Red Rock leads to an Applied Associate of Science Degree in Diagnostic Medical Sonography. This track prepares students for the ARDMS examination in the areas of Abdominal and OB/Gyn. Graduates typically work in a radiology setting at a hospital or outpatient center. Medical Sonography is a growing specialty in the healthcare field. Sonography uses high-frequency sound waves to produce images of internal body structures. These images help a physician make a diagnosis. Students are taught how to produce high-quality images through in-depth instruction. This instruction includes classroom as well as hands-on experience in lab and clinical settings. Program courses include introduction to sonography and patient care, sonographic physics, abdominal sonography, obstetrical/ gynecological sonography and vascular sonography. Graduates receive an Associate's degree in Applied Science in Medical Sonography. The CFCC Sonography Program is accredited by the Commission on Accreditation of Allied Health Education Programs. The Medical Sonography program at Southwestern Community College provides knowledge and clinical skills in the creation of images of internal body structures. Students learn normal anatomy and pathological processes, use of equipment, fetal growth and development, and patient interaction skills. Upon graduation from the sonography program, you will be able to apply to take the national certification examinations offered by the American Registry of Diagnostic Medical Sonographers. Graduates typically find employment in clinics, physician's' offices, mobile services, hospitals, and educational institutions. Graduates who successfully complete the certification exams receive the credential Registered Diagnostic Medical Sonographer. Diagnostic Medical Sonography (DMS) uses high-frequency sound waves to create detailed images of the human body. These images play a key role in a medical diagnosis and treatment. The profession requires a high degree of independence, judgment, knowledge, maturity and stamina. A sonographer has an in-depth knowledge of physics, disease processes, human anatomy, and sonographic technique necessary to create ultrasound images. The role of ultrasound in medicine is growing and the field's development depends on highly qualified and trained sonographers. Currently, demand is high across the country. Salaries vary greatly by region. A sonographer's earning potential tends to increase based on experience, title, education and specializations. A graduate of the sonography program at A-B Tech is prepared to be a skilled healthcare professional. Graduates use high-frequency sound waves to produce images of human organs, tissues, or blood flow inside the body. Graduates of accredited programs may be eligible to take exams administered by the American Registry of Diagnostic Medical Sonographers (ARDMS). A-B Tech graduates receive an Associate in Applied Science in Medical Sonography degree and are eligible for the following ARDMS registries: Sonography Principles and Instrumentation, Abdomen, Obstetrics/Gynecology, and Vascular Technology. Graduates typically find employment in clinics, physician's' offices, hospitals, or educational institutions. Located in Sedalia, Missouri, State Fair Community College is a non-profit, public institution serving the needs of West-Central Missouri. Offering an outstanding teaching staff, small classes with a high teacher-to-student ratio and a beautiful campus, SFCC boasts one of the lowest tuition rates and fees within the state. SFCC offers an Associate of Applied Sciences degree in diagnostic medical sonography, with an intense, 22-month program that prepares students to perform and evaluate ultrasound exams and procedures. Most of the courses in the curriculum are offered online, with the exception of clinicals and scanning labs. Serving more than 15,000 students each year, Johnston Community College is an accredited member of the North Carolina Community College System. Located 30 miles east of Raleigh in Smithfield, the campus offers over 40 occupational programs and continuing education courses, in state-of-the-art facilities with scenic views. The program in medical sonography provides students with critical skills in applying high-frequency sound waves to internal body imaging. Students will attain competencies in identification of normal anatomy and pathological processes of the abdomen, superficial structures, gynecology, fetal development, cardiac, cerebrovascular, and peripheral vascular systems. In addition, assessment of the integration of related imaging, equipment usage, and patient interaction prepares graduates for employment in hospitals, clinics and physicians' offices. Lufkin, Texas-based Angelina College is an institution of higher learning, offering over 5,000 students undergraduate degrees with both academic and vocational programs. Located in the heart of East Texas, Angelina offers small classes, a beautiful campus and economical tuition rates. Offering an Associate in Applied Science degree in diagnostic medical sonography, this concentrated program provides a comprehensive education in general sonography for preparation in the profession. With a combination of intensive coursework, practical knowledge and a variety of clinical experiences, the program develops competent, responsible, and independent sonography professionals, supported by a dedicated team of experienced faculty, sonographers and physicians. Owens Community College is a comprehensive, community educational institution with a campus located in downtown Toledo, Ohio. Featuring an average class size of 15 students, Owens offers a faculty with real-world experience in their chosen fields who provide personal attention to each student's academic pursuits. Offering an accredited career in diagnostic medical sonography technology through a Associates degree in Applied Science, graduates train for positions as ultrasound technologists or medical sonographers in clinics and hospitals, and to stand for exams to apply for certification from the American Registry of Diagnostic Medical Sonographers and the American Registry of Radiologic Technologists. Preparing students for careers in sonography, medical education, research and equipment technology, Delaware Technical Community College offers a variety of concentrations at their Wilmington and Georgetown campuses. Fully-accredited and centrally-located in the mid-Atlantic states, DTCC focuses on offering Delawareans an open-admission institution of higher education, for those focusing on careers in hospitals, healthcare facilities, imaging centers, physician offices, and educational institutions, as well as working as technicians for equipment manufacturers. The program will also prepare qualified graduates to pass the American Registry for Diagnostic Medical Sonography (ARDMS)-administered national registry examinations. Students admitted to Middlesex Community College's diagnostic medical sonography program can expect a well-rounded education. The two year program is full time and includes a clinical internship 24 hours a week. Students are available to graduate following completion of the 68 credits taken in classes ranging from sonographic physics to classes focused on the relationship between sonographer and patient. The program is physically demanding in preparation for careers in the field. Graduates of the program can take the American Registry of Diagnostic Medical Sonographers certification exam to become eligible to work in the ultrasound field nationwide. Diagnostic medical sonography is one of the various vocational programs offered at Wallace State Community College, in Hanceville Ala. The program is 17 months long, beginning each Aug. and ending in Dec. the following year. Students in the program gain valuable hands-on experience while working at clinical sites each week. Clinical sites are located throughout Northern Alabama and Southern Tennessee. In order to be admitted into the program, applicants must have completed the 24 credits of general and pre-sonography courses, as well as submit an ACT. Each year the program selects 25 applicants with the highest combined ACT and GPA. Del Mar College strives to provide an excellent future for their diagnostic medical sonography students. The bulk of the classes are held during the day, and the program includes mandatory clinical rotations offered in various clinics throughout the area. The program trains students in specialty practices including abdomen, obstetrics, gynecology, heart and vascular sonography. All students must obtain their Certified Nursing Assistant certificate before graduating from the program, an asset that students may find useful following graduation. Students who complete the five semester program can take the American Registry of Diagnostic Medical Sonographers certification exam. Diagnostic medical sonography students at the College of DuPage are offered three programs, varying from a six month vascular sonography program, an 18 month general sonography program and a two year Associate of Applied Science degree program. Some prerequisites to being admitted include two completed years of a health science program and an up-to-date license in the health field. The diagnostic medical sonography program helps future sonographers hone their flexibility and communication skills. The College of DuPage boasts that 94 percent of the program graduates from 2014 have since obtained a job in the sonography field. Central New Mexico Community College's diagnostic medical sonography program helps develop future health care professionals for the field through intensive hands-on training. The program prepares students in specialty areas such as breast, abdomen and obstetrics. Due to small class sizes, the college utilizes a coordinated entry program to screen applicants by requiring a pre-registration form. Once admitted to the program, students have seven terms to complete the Applied Associate of Science degree. The degree takes approximately two years to complete, and graduates are eligible to take the exam to become a Registered Diagnostic Medical Sonographer. Florida's Hillsborough Community College offers students of the Diagnostic Medical Sonography Technology program small classes with big results. In 2013 and 2014, 100 percent of students passed the American Registry of Diagnostic Medical Sonographers examinations to become certified sonographers. During the two-year AS program, students learn sound wave technology to capture anatomical images and study ultrasound physics, obstetrics, gynecology and instrumentation. Practicums are completed on and off campus. For admission, applicants must complete 18 prerequisite credits in physics, biology and anatomy. Graduates of the AS program are granted acceptance into the University of North Florida's Health Sciences BS program or can take the ARDMS examinations. The Diagnostic Medical Sonography Certificate program at Chattanooga State College is designed for working healthcare professionals to become certified sonographers. To be considered for this specialty certificate program, applicants must have a license in a healthcare field and be graduates of an AAS program. Those applicants with no previous experience in sonography must be considered full-time students. The certificate program lasts one year with classes held every other week, including lab and lecture hours. Students can expect specialized studies to focus education on the abdomen and "small parts", obstetrics, gynecology, and physics. The Harrisburg Area Community College prepares students for immediate entry-level employment upon graduation from its Diagnostic Medical Sonographer AS program. In the last five years, 100 percent of graduates seeking employment have found positions in the field as the program requires students to take the ARDMS examinations. Students complete 81 credits through labs, lectures and clinical. Intense clinicals at HACC are eight-hour days spent at recognized medical facilities that could be located up to 85 miles away from Harrisburg. Requirements for admittance into the program include a minimum 2.5 GPA, a physical examination, immunizations be completed, and one day spent shadowing a professional. Students interested in sonographic careers receive seven months of valuable hands-on experience at Chippewa Valley Technical College during an internship opportunity incorporated into the Diagnostic Medical Sonography AS program. The two-year program prepares students for futures as ultrasound technicians, sonographers, cardiac sonographers, or alternatively, for a future in continuing education. Students learn the fundamentals of performing diagnostic procedures, obtaining ultrasound images and analyzing information. Upon completion of the course, students competently perform ultrasounds on many body systems. The Diagnostic Medical Sonography program at Chippewa Valley sees 83 percent of graduates finding employment in the field. The Diagnostic Medical Sonography AAS program at Montgomery College allows students flexibility to choose from three study paths, general sonography, echocardiography or vascular sonography. During two years of study, students take control in the usage of ultrasound waves for recording data and images to be read by a physician. Applicants must complete 22 credits of prerequisite general education courses before acceptance and maintain a valid CPR certification. As each course level builds upon the next, students enrolled in the program are expected to achieve a "C" or higher in all core sonography courses. Graduates of the AAS program can take the ARDMS examinations in specialized areas. Lorain County Community College offers an associate's degree in diagnostic medical sonography that allows students access to several specialization fields of sonography including abdominal, obstetrics/gynecology, and an introduction to vascular/blood flows. Additionally, students may also choose to specialize in neurosonography, vascular, echocardiography, or ophthalmology. This comprehensive program enables graduates the ability to pursue a wide variety of careers in sonography through their interactive hands-on program which enhances the standard classroom curriculum. Fully accredited, the college offers financial aid to those who qualify and is a military friendly school. They pride themselves on producing highly competent graduates for today's workforce. The diagnostic medical sonography program at the Dona Ana Community College in New Mexico offers two pathways for working in this field. Students with an existing associate degree in a related field can pursue the certificate in diagnostic medical sonography and those not qualified for this track can complete an associate degree of applied science. Both programs help qualify students for jobs performing sonograms in the abdominal area and in obstetrics/gynecology, earning a median nationwide salary range above $67,000, and the possibility of nationwide certification. The programs are approximately 17 months long and include both a clinical internship and coursework. Located in a suburb of Chicago, Illinois, the culturally diverse Triton College offers both an associate in applied science degree requiring 71 credit hours or a 41 credit hour certificate program for students who already possess a certification or degree in a specific related field. Curriculum includes basic theory, lab, and clinical instruction which enables graduates to pursue employment in the area's many health care facilities as a general diagnostic medical sonographer. Students also receive an introduction to peripheral vascular imaging. Triton College is a fully accredited institution offering financial aid, scholarships, and veteran benefits to those who qualify. Spokane Community College's AAS degree program in diagnostic medical sonography helps prepare students for a thriving career as a sonographer. The 104-credit program begins with courses in human physiology and disease, diagnostic ultrasound and vascular fundamentals, and culminates with a series of sonography clinicals providing hands-on practice in a healthcare setting. Students emerge from the program with effective communication skills and the ability to perform sonographic exams, interpret results and aid physicians in meeting patients' needs. Program graduates are eligible to sit for the national Abdomen and OB-GYN registry examinations, which are administered by the American Registry for Diagnostic Medical Sonography. Offered at both the Georgetown and Wilmington campuses, the AAS degree program in diagnostic medical sonography provides students with the skill set needed to become a sonographer, manager, educator, researcher or equipment specialist. While both campuses offer general sonography learning concentrations, the Wilmington campus is also home to a cardiovascular track targeted at diagnosing heart abnormalities and vascular disease. Upon program completion students are prepared to pass the national registry examinations administered by the American Registry for Diagnostic Medical Sonography. Both campuses are dedicated to helping graduates find employment, and those who wish to pursue a bachelor's degree may do so via the college's affiliated four-year institutions. Bunker Hill Community College students can pursue an AS in general sonography or cardiac sonography depending on area of interest. Both programs start in the fall and have instructional and clinical components that provide hands-on learning. Students pursuing their AS will learn to use ultrasound equipment, identify and interpret sonography images, and communicate with physicians and patients regarding ultrasound findings. The program gives graduates the knowledge to pass the American Registry for Diagnostic Medical Sonography Exam (Sonography Options). Careers are available in hospitals, community health agencies, HMOs or other healthcare facilities. There is also the option to work for equipment companies or in sales. Getting an AAS degree in diagnostic medical sonography at El Paso Community College means a step towards a career in ultrasound. The 65-credit program begins with a summer semester of core courses and progresses with ultrasound classes and clinical practicums that give students firsthand experience. Highly competitive, the program only admits seven students each term. After completing the course, students are prepared to take the American Registry for Diagnostic Medical Sonographers national exam. Graduates of the program are equipped to perform exams in OB-GYN, abdominal, neurosonology or cardiac ultrasound depending on experience and expertise. There is also the option to work for ultrasound companiesâ€”in sales, research or application. Gateway Community College is home to an AAS in diagnostic medical sonography program that full-time students can complete in 21 months. The program is made up of core courses, diagnostic sonography and ultrasound imaging classes, and clinical practicums offered in partnership with area healthcare centers. Sonography students learn sonographic positioning and techniques, how to develop film in a dark room, equipment maintenance and record keeping. Students who complete the program can sit for the American Registry for Diagnostic Medical Sonographers national registry exam in Abdomen and OB-GYN. Along with technical training, Santa Barbara City College is focused on creating compassionate sonographers who are equipped to serve diverse patient populations. This certificate program requires roughly 30 hours of clinical experience credit hours, and students can also take a supervised work experience course for on-the-job training. The 21-month program begins every other year, spanning six semesters over the fall, spring and summer and one winter intersession. Courses must be completed in order. Labs and lectures are typically scheduled over the weekend. Many graduates of this program go on to successfully find employment and secure abdomen and OB-GYN credentials. Sonography training at Alvin Community College is specifically geared toward ultrasound exams of the heart or blood vessels; students can pursue adult or pediatric echocardiography or vascular sonography. The coursework varies for these specialties, but all graduates will be educated in basic technology, clinical skills and cardiovascular concepts. Alvin offers a two-year associate of applied science degree, or a condensed advanced technical certificate program for students with degrees in a related field. For both programs, instruction takes place during the day with some exceptions. Job placement and credentialing success rates are at or near 100 percent for adult echocardiography and vascular sonography, and 75 percent for pediatric echocardiography. Temple College's diagnostic medical sonography program is designed to put graduates on the right path to succeed in an entry-level position. The curriculum provides a foundational education in sonographic physics and technology, while also focusing on the experiences graduates will encounter on the job. The two-year program comprises 65 semester hours of class. Some evening and weekend availability is required for clinical training. Students with a degree in radiologic technology or a related field are also eligible for an advanced technical certificate. For additional support, tutoring and online tutoring is available to Temple College students. In order to provide students with a comprehensive education in diagnostic medical sonography, Delgado Community College has built its curriculum around real-time practice and observational learning as well as reading and lectures. The 16-month post-associate certificate program offers general training in abdomen, obstetrics, gynecology and physics and instrumentation. Delgado students can expect a personalized educational experience due to the small class size; just 12 students are accepted to this program per year. The faculty also assists students and graduates in seeking employment after program completion. Typically, the program lands more than 90 percent of graduates in jobs within 12 months. Though Blackhawk Technical College's ultrasound education will prepare graduates for entry-level employment, the program also provides the opportunity to specialize within the field. Accredited specialty options at Blackhawk include abdominal, vascular and gynecological sonography. Blackhawk's associate degree in diagnostic medical sonography/vascular technology takes two years to complete. It runs on a full-time weekday schedule, Monday through Friday, but limited online courses are available during the first summer semester. Certification success rates for abdomen, OB-GYN and vascular technology are 85, 80 and 58 percent, respectively. Since 1926, Tyler Junior College has helped students achieve academic and professional success. Despite being one of the largest community colleges in Texas, their CAAHEP certified diagnostic medical sonography program is competitive due to the limited enrollment of only 12 students each year. The program is a full-time, two year (16 month) commitment, requiring clinical rotations at various East Texas hospitals and clinics. Graduates of the program have the option of applying for the four month Advanced Vascular Technology Certificate, giving a competitive edge to students entering the field. Adult students and single parents have on-campus support through Adult Student Services. Marion Technical College in Marion, Ohio offers an associate's degree of applied science in diagnostic medical sonography. This CAAHEP certified program can be attended either full or part-time; the curriculum for full-time enrollment is two years, or six semesters in length. The program requires 32 hours at three clinical sites, with a total of 64 credit hours for AAS attainment. Applicants with professional experience or previous training may be able to earn credits by passing proficiency exams to verify skill level. Enrollment is limited to keep class sizes small, guaranteeing one-on-one focus from experienced and knowledgeable faculty. Prospective students can earn a certificate in diagnostic medical sonography in just 13 months from Volunteer State Community College through their program that combines clinical training with classroom study. Students may learn about acoustic principles and safety, and how to perform abdominal, obstetrical/gynecologic and small parts sonography. Upon graduation from this program, students are encouraged to take examinations performed by the American Registry of Diagnostic Medical Sonographers for professional certification which opens doors to nationwide employment opportunities. Students who pursue this certificate must already possess an associates degree in a specific related field or a bachelor's degree, as well as certain pre-requisite course requirements. St. Philip's College offers an associates degree in diagnostic medical sonography that equips students with the skills to perform ultrasounds for patients in hospital and clinics through their two year program. Students will receive training in abdominal, obstetrical, and gynecological sonography and follow the ethics of the Society of Diagnostic Medical Sonographers. In addition to completing prerequisite courses, prospective students are required to pass the Essential Academic Skills test, and agree to work between 40 and 200 volunteer hours. Upon completion of the program, graduates are encouraged to become certified by the American Registry of Radiologic Technologists by taking their exam. Midland College in Texas has a strong commitment to turning students into active, knowledgeable and compassionate healthcare professionals. The diagnostic medical sonography program offers an associate's degree and an advanced technical certificate. The program has limited enrollment and potential applicants must meet prerequisite requirements in order to be considered. The program consists of 69 credit hours to be completed in four semesters, part-time enrollment is also available. Practical experience is gained through clinical rotations and at the on campus health lab, the F. Marie Hall SimLifeCenter, where manikins and state of the art equipment used by healthcare professionals help reinforce skills and curriculum. Since the first class of nurses graduated from Allen College in 1928, the school has taken great pride in educating healthcare professionals. Students specializing in diagnostic medical sonography have multiple academic paths from which to choose. Start by earning your associate in applied science degree in radiography, then move on to get a bachelor's of health sciences degree in diagnostic medical sonography (124 credit hours) or go for a certificate in diagnostic medical sonography (81 credit hours). The CAAHEP certified diagnostic medical sonography program requires clinical observations at a variety of area clinics, as well as job shadowing. At Palm Beach State College in Florida, classroom curriculum is paired with a fully equipped, modern lab on campus. Simulation technology allows students to practice on mannequins, helps faculty and fellow students to reinforce theory, and prepare individuals for working with patients in the four required clinical observations at various locations. They currently offers an associate in applied science degree, or a college credit certificate for students who already have a degree or certification. Faculty members in the sonography program are dedicated veterans of the industry with a passion for patient care. Enrollment is limited, and students must attend full time. At Bellevue College in Washington, students can earn an associate degree in diagnostic ultrasound while choosing to focus on either general ultrasound, vascular technology ultrasound, or echocardiography ultrasound. The program requires 112 credit hours and is a two-year, full-time commitment. Additionally, the college offers a certificate for breast ultrasound, completed in three quarters, for students or active professionals looking to expand their skills. Studying in the diagnostic ultrasound program requires clinical observations where students learn practical skills such as communicating and working with patients. Graduates of the diagnostic ultrasound program are eligible to sit for the American Registry of Diagnostic Sonographers exam. Founded in 1924 by the Sisters of Mercy, Misericordia University in Pennsylvania is a great place for students interested in the diagnostic medical sonography program to tailor their studies to fit their lifestyle and individual needs. Earning a bachelor's degree can be done at either a part-time or full-time pace. For individuals looking to expand an existing skill set, a diagnostic medical sonography certificate is available. The program is CAAHEP certified and in addition to traditional coursework and clinical observations, some classes are online. Graduates from the program are eligible to take the ARRT sonography and the ARDMS certification examinations. At the Rochester Institute of Technology in New York, studying for a bachelor of science degree in diagnostic medical sonography is an immersion experience, from clinical rotations, to the on-campus Ultrasound Scanning Suite. Students hone fine skill with state-of-the-art equipment such as the OB/GYN simulator, under the guidance of experienced and knowledgeable faculty. In addition to bachelor's degree, the college offers certifications in diagnostic medical sonography or echocardiography for students who hold a life sciences degree or who have a current medical license. The program is CAAHEP certified, and graduates are eligible to sit for the ARDMS examination. The University of Rio Grande and Rio Grande Community College come together to offer an associate of applied science in diagnostic medical sonography and a bachelor's degree program. The associate's degree program offers two different concentrations, general diagnostic medical sonography and cardiovascular diagnostic medical sonography. Graduates of these programs are eligible to sit for the ARDMS examination. Enrollment in the program is limited due to clinical sites. Students are interviewed after the first year and the top students move on to year two. For students interested in the bachelor's program, a similar review process takes place after the completion of the associates degree. Founded in 1919, Lincoln University in California is dedicated to diversity and the academic and professional achievement of their students. The college offers a bachelor of science in diagnostic imaging degree, where students focus on one of three concentrations; sonography, vascular ultrasound, or echocardiography. Curriculum is 122 units in length, and requires two clinical rotations where students gain a professional perspective on the skills, technique and theory they learn in the classroom. The ultrasound/ECG lab on campus allows faculty and students to interact using the most modern equipment in the field. Some credits or coursework can be substituted by work experience. The Diagnostic Medical Sonography Program at Santa Fe College uses various teaching methods and provides multiple academic settings for its students. With both in-classroom instruction and laboratory participation, students are able to expand their education through various learning outlets. This allows students to gain knowledge within a classroom setting and later apply that information in a laboratory. The 2-year program coordinates with hospitals and imaging centers within the area. The courses are designed to provide students with the skills they need to earn an Associate of Science degree. Once students complete the DMS program, they become qualified to take the national certification examination. St. Catharine College encourages students who have a passion for helping others pursue an Associate of Science in Diagnostic Sonography. Located in Kentucky, the St.Catherine College provides the opportunity for students to get both in and outside classroom instruction. The exceedingly ambitious program consists of a limited number of students which aids in their small class sizes. Students do not have to have a degree nor any experience within the medical field to be accepted in the program. Outside classroom instruction includes clinical training which will better prepare students for the national registry board examinations. St. Catharine College offers great services such as tutoring and the Center for Student Support. Pensacola State College provides a two year Diagnostic Medical Sonography AS program for students. The program is accompanied by a clinical segment and has specific requirements that students must fulfill in order to apply. Once accepted and successfully completed, students have the opportunity to take the American Registry for Radiologic Technology (ARRT) sonography assessment. Pensacola State College offers students with the option of getting a job on campus, or participating in the Career and Technical Education programs while attending the program. Academic advising, estimated living costs, and financial aid are just a few things Pensacola State College provides for its students. The two year Diagnostic Medical Sonography Associate in Science program at Valencia College is designed to prepare students for a future in Sonography. Sonographers play a very influential role within the medical flied. Throughout the duration of the program students will learn in which ways their position holds when it comes to the well-being of patients. Valencia College provides students with a smaller classroom size, which maximizes the amount of assistance needed to succeed. Classes are offered both online and on campus. Students also have room for a flexible schedule with class times ranging from morning until evening. Classes are also offered during the weekend. St. Catherine University has been a top-ranked health care educator since 1905. The sonography program at St. Kate's has an outstanding reputation for educating students through both lecture, one-on-one hands on labs and clinical training. The faculty also walks students through caring for real patients experiencing a wide variety of medical conditions, using advanced ultrasound imaging equipment. At the end of the four-year program, students can take national certification exams in ultrasound physics, abdominal, obstetrical and gynecological ultrasound or to become a Registered Diagnostic medical Sonographer (RDMS). The sonography program at St. Kate's is accredited by the Commission on Accreditation of Allied Health Education Programs (CAAHEP). The radiographic science degree at Lewis-Clark State College (LCSC) is a competitive three-year program delivering one year of pre-professional courses and two years of professional clinical training. Students have access to various clinical training sites from small clinics to large regional medical centers, ensuring a well-rounded and diverse experience. At the completion of the program students are prepared to take the national radiography certification exams put on by the American Registry of Radiologic Technologists (ARRT). Graduates of LCSC's radiographic science program enjoyed a 100 percent job placement rate in 2015. Newman University consistently boasts a high first-time board exam pass rate for graduates of their sonography program. The BS in diagnostic medical sonography program is 21 months long and includes lecture, laboratory exercises and rotations in a clinical setting. Faculty pairs the instructive learning with clinical education for a comprehensive and well-rounded experience. At the conclusion of the program students will know how to provide patient care, perform procedures recording anatomical, pathological and physiological data, and process sonographic data. In addition, students can take the American Registry of Diagnostic Medical Sonographers exams, and if they choose to, sit for physics, abdomen, OB/GYN and vascular registries. The University of Charleston's (UC-Beckley) BS in diagnostic medical sonography degree gives students the opportunity to obtain employment in their intended field while completing the program. The degree combines hybrid learning, hands-on laboratory experiences and on-site clinical training. Graduates of the program complete five clinical rotations, 1,700 hours of clinical training in a hospital/clinic setting and more than 1,000 hours in UC Beckley labs with faculty who are registered diagnostic medical sonographers. The diagnostic medical sonography program is accredited by the Commission on Accreditation of Allied Health Education Programs. The diagnostic medical sonography program at Keiser University has produced consistently high job placement and credentialing pass rates for the last three years. Students complete the program prepared to enter the field as a highly skilled entry-level diagnostic medical sonographer. The two-track program must be completed on campus and is available in the following Florida cities: Daytona Beach, Fort Lauderdale, Fort Myers, Melbourne and New Port Richey. The program requires students complete 26 general education course credits, and either 55 course credits for Track 1 (general concentration) or 65 course credits for Track 2 (general and vascular concentration). The College of Southern Nevada offers two Associate of Applied Science degrees for students interested in becoming a diagnostic medical sonographer; the first program is the General/Vascular Ultrasound and the second is the Cardiac/Vascular Ultrasound. As the only program in Nevada accredited by the Commission on Accreditation of Allied Health Education Programs, graduates of the program emerge ready to gain entry-level employment as general sonographers. Because of that accreditation, students are able to become certified as Registered Diagnostic Medical Sonographers prior to graduation. The program at CSN can be completed in six semesters with a total 92 credits. Students who have completed an AAS, BS, or Diploma in Radiologic Program and are looking to expand their education into Diagnostic Medical Sonography should consider the certificate program at Trocaire College. The one-year program can be completed with 36 credits in two semesters combining classroom, laboratory, and clinical education to prepare the future sonographer for a variety of medical settings. Once the program is completed, graduates are eligible for the American Registry of Diagnostic Medical Sonography exams in Physics, Abdominal, and OB/GYN sonography. The program has an impressive 91 percent job placement rate and demand for ultrasound technicians is only expected to grow within the next decade. Students at Jackson College can choose between an AAS in General Sonography, an AAS in Cardiac Sonography, and in Vascular Sonography students can choose from an AAS, a Certificate, or three different skill sets. The General Sonography program is a second admit program which combines classroom and clinical experiences to prepare graduates for general sonography or some specialized areas. The Cardiac Sonography program is similar, but prepares students for the examinations to become a Registered Diagnostic Cardiac Sonographer through ARDMS. The Vascular Sonography program offers students the most options; if students already have a degree, they can pursue skill sets or the certificate to expand upon their skills. Saint Luke's Health System boasts a 100 percent pass rate for its 18-month program in Diagnostic Medical Sonography. Students in the program are exposed to abdominal, neurological, obstetrical/gynecological, and vascular ultrasound specialty areas in the course of their studies, which include rotations through several clinical sites. The program is accredited by both the CAAHEP and the JRC-DMS and graduates of the program will be qualified for the American Registry of Diagnostic Medical Sonography examinations in OB/GYN, Abdomen, Vascular, and Physics specialities. The program's Class of 2015 has an impressive 0 percent attrition rate, 100 percent job placement rate, and and 100 percent of students that sat for examinations passed them. The Diagnostic Medical Sonography program at Baptist College of Health Sciences prepares future ultrasound technicians through coursework and clinical experience totalling 126 credits. The program is CAAHEP accredited and graduates receive a bachelor of health science degree upon graduation. The hands-on experience is exhaustive, providing students with the opportunity to perform general, vascular, cardiac, abdomen, obstetrics, gynecology, and pediatrics sonographic examinations. Graduates are eligible for credentials as RDMS, RDCS, and RVT upon completion of the program and applicable examinations. The credential success rate for the class of 2015 was 100 percent in all four categories (SPI, RDMS, RVT, and RCDS). Weber State University, founded in 1889, awarded its first baccalaureate degree in 1964. Today the university offers more than 225 undergraduate degree and certificate programs and 13 graduate degrees. Applicants to the B.S. in Diagnostic Medical Sonography program must already be an ARRT registered technologist or professional equivalent. Transcripts are required demonstrating previous post-secondary coursework related to sonography. The degree curriculum includes 6 hours of DMS courses, 24 hours of radiography studies, and 6 hours of electives in the field. To meet graduation requirements, students must also complete 20 hours in a DMS emphasis: cardiac, medical, or vascular. Established as a branch of the main OSU campus in Stillwater in 1961, Oklahoma State University-Oklahoma City has emerged as technology oriented institution awarding 40 degrees and certificates through seven divisions. Its University of Oklahoma College of Allied Health offers pre-requisite courses and a 64-hour program leading to the two-year degree in medical imaging and radiation sciences. Students may also gain admission by completing a two-year associate degree at Southwestern Oklahoma State University, Rose State College, Sayre, Bacone College, and Tulsa Community College. Graduates are prepared for professional registration in Oklahoma. Concordia University-Wisconsin was founded by Lutherans as Concordia College in 1991. Nine different classroom locations support the university's current nine associate, 70 bachelor degrees, four doctoral programs and 35 certificates. CU's four-year BS in Diagnostic Medical Sonography program features small class sizes led by experiences faculty. The first two years include on-campus coursework in pre-clinical training and the liberal arts. The second two years include clinical tracks in either General/Vascular or Cardiac/Vascular Sonography. The clinical component can be taken up to four days a week. Toward the culmination of either clinical track, students are prepared to register for certification exams. At Upstate Medical University, students can pursue a Bachelor of Science (BS) or Bachelor of Professional Studies (BPS) in Ultrasound. Those seeking a BS degree do not need to hold any prior undergraduate degrees for admission. BPS students must be certified or certification-eligible for the American Registry of Radiologic Technologists credential. Either degree may be completed in two years by full-time students. Students participate in a clinical practicum each semester and must complete an ultrasound senior project to graduate. The College of Health Professions is affiliated with SUNY Upstate Medical University. Broward College was originally part of the Florida community college system but began offering four-year degree programs in 2008. Today it serves more than 65,000 students a year through its three campuses. The 77-credits required for the A.S. degree in Diagnostic Medical Sonography at Broward can be completed in two years. Two days a week, students attend didactic classes, while completing three, eight-hour clinical sessions the other days. Applicants to the program must have completed a two-year program in a patient-care related discipline that leads to professional credentials. Maximum class size in the degree program is 18 students. The day it first began classes in 1960, Miami Dade College drew 1,440 students. By 2001 when it offered its first bachelor degree, MDC had enrolled its 1 millionth student. Today MCD confers the most associate degrees in the United States. The two-year Associate in Science degree in Diagnostic Medical Sonography is conducted over 6 consecutive semesters. In addition to classwork, students must complete a total of 1,920 hours of supervised clinical rotations to qualify for graduation. Upon completing the degree, students are eligible to take the credential examination from the American Registry of Diagnostic Medical Sonography: Obstetrics and Gynecology, Abdomen, and Adult Echocardiography. Ferris State University offers students a choice from six undergraduate degrees (associate/bachelor), 11 master's degrees, four doctorates and 70 certificate programs. The Associate in Applied Science in Diagnostic Medical Sonography requires a minimum of 87 credit hours for graduation. Students may be required to complete up to 15 hours of qualification courses to begin the program. These include studies in medical vocabulary, anatomy/physiology, physics, intermediate Algebra, and English. The Big Rapids campus hosts the first three semesters of coursework, and students work with patients in an approved clinical setting the final three semesters. Lewis University, founded in 1932, is sponsored by the De La Salle Christian Brothers. It offers 80 undergraduate degrees, 35 graduate programs, and two doctorates. The university's Bachelor of Science program in Diagnostic Medical Sonography is conducted for the first three years on campus and in the final year, students engage in clinical rotations at Northwestern Memorial Hospital. Of the 150 credit hours required for the degree, 107 hours are devoted to the DMS major. Toward the end of the fourth-year professional phase, students undertake a registry review of abdomen, OB-GYN, and physics topics required to take the American Registry of Diagnostic Medical Sonography examination. Students at Benedictine University can choose from 56 undergraduate degrees, 19 graduate and doctoral programs, and 34 graduate certificates. The private, Roman Catholic university holds a Carnegie Classification as a doctoral/research institution. Enrollment includes 3,300 undergraduates and 2,490 graduate students. Benedictine students entering the BS in Diagnostic Medical Sonography program spend their first three years at the university's Lisle, IL campus. Following completion of didactic studies, students undertake their 45-semester-hour clinical requirements at Northwestern Memorial Hospital. Class sizes are small – with a 13:1 student-to-faculty ratio. Consequently, admission to the program is highly competitive. Founded in 1964, Polk State College serves 20,000 students with associate and bachelor degree programs in the arts and sciences. Polk also provides career training leading to certificates in the vocations. The Polk State College Diagnostic Medical Sonography Program begins each year in January, with pre-requisites required in algebra, medical terminology, human anatomy/physiology, and English composition. In addition to campus didactic courses, students must complete four clinical practicums. Upon completion of the 77-hour associate of science degree requirements, students are eligible to sit for the American Registry of Diagnostic Medical Sonographers national registry examination. As Michigan's largest independent college, Baker College of Auburn Hills offers associate, bachelor and master's degree programs along with certifications in professional fields and vocational trades. The Diagnostic Medical Sonography associate degree program at Baker combines academic and clinical training, preparing graduates to qualify for American Registry of Diagnostic Medical Sonography (ARDMS) certification examinations. Students must complete 85 hours of classes and clinical experience while satisfying general education requirements that may be transferred to a four-year program. The program focuses on developing students' critical thinking, communication, and technical skills necessary to become a Registered Diagnostic Medical Sonographer. Oregon Institute of Technology offers degree programs that combine theory and practice to prepare graduates for the real-world workplace. Students build a well-rounded practical education through lab-based classes, clinics, and externships. Oregon Tech's 4,800 students benefit from small class sizes. Participants in the Diagnostic Medical Sonography program must complete 192 credits of class and clinical work to earn their B.S. degree. A 45-hour Diagnostic Medical Sonography Externship is required in the senior year. In addition to the comprehensive DMS coursework, specialization options are offered in obstetric and gynecologic, abdominal, and breast sonography. Founded in 1957, Gulf Coast State College, located along the shore in Panama City, was the first public two-year institution in Florida. Today, GCSC offers four Bachelor of Science degrees along with 75 Associate in Arts degree programs with transfer tracks and Associate in Science degrees and technical certifications designed for the workplace. The Diagnostic Medical Sonography associate degree program combines academic courses with supervised clinical training. Students can choose a DMS specialty in abdomen, vascular, or obstetric and gynecologic imaging. Program graduates may sit for the national certification exam offered by the American Registry of Radiologic Technologists. GCSC's 24-month DMS program is offered through the Health Sciences Division which hosts more than 600 students pursuing healthcare-related training. More than 200 programs at Washburn University lead to certification, associate, bachelor, master's, and doctor of nursing practice degrees. Administered by the Department of Allied Health, the 124-hour Bachelor of Health Science in Diagnostic Medical Sonography (BHS) at Washburn University offers all didactic courses online. The distance learning component has been successfully used for more than a decade. Enrolled students complete their supervised clinical rotations at approved facilities in the county. The faculty has more than 70 years of combined experience in the ultrasound disciplines. Students can opt for specialties in vascular, cardiac, or general sonography. Founded in 1853, Mount Aloysius College is one of 18 Mercy-backed schools in the nation. More than 21,500 students today enroll in small classes that may ensure successful program completion. MAC offers 70 academic undergraduate and graduate programs with as many as 20 concentrations in each field. Diagnostic medical sonography majors can pursue either an associate or bachelor's degree. The 136-credit bachelor's degree in diagnostic medical sonography requires students to complete 90 credits in medical imaging coursework. Specializations include concentrations in cardiovascular, upper/lower extremity imaging, and abdominal/pelvic sonography. Four-year students must also complete five clinical practicums to earn their degree. The University of Missouri-Columbia School of Health Professions (SHP) represents Missouri's only public health program that is conducted on a health sciences campus. Enrollment at SHP has increased by 230 percent since 2002. The Diagnostic Medical Ultrasound (DMU) Programs lead to a Bachelor of Health Science (BHS) and a Master of Health Science (MHS) in Diagnostic Medical Ultrasound. The BHS program is conducted year round, with clinical rotations offered at more than 25 approved sites throughout the state. Fieldwork placements require students to pass a criminal background check. Students are advised to complete either physics or anatomy coursework before their sophomore year through summer school. Seattle University serves more than 7,000 students with 64 undergraduate and more than 31 graduate degree programs. Students can also complete one of 28 certificate programs. The average class size is 19 students. Undergrads in Seattle University's Bachelor of Diagnostic Ultrasound program must complete 180 credits to receive their degree. The core of ultrasound classes must be undertaken in two years, which may require students to attend over the summer to complete the credits. Graduation requirements also include 26 hours of internships and the completion of a senior thesis. Transfer students must complete math and science prerequisites prior to admission to the program. Located in Pasco, Washington, Columbia Basin College has served students in Franklin and Benton counties since May 1955. Each academic quarter, it currently enrolls 8,000 students. Offered through the Department of Allied Health, CBC's Diagnostic Medical Sonography baccalaureate program requires completion of 33 didactic class hours, coupled with 22 hours of direct clinical experience. Program applicants must have completed the equivalent of an accredited two-year degree in radiologic technology or accrued 60 hours of coursework in a healthcare field. Admissions are highly competitive, with only the top-25 applicants invited to campus for a selection interview. All classroom lectures and laboratory work must be completed before required clinical experiences. Since it was founded in 1902, Fort Hays State University has grown its campus and academic programs to serve 14,210 students, nearly half of whom through online studies. The Department of Allied Health conducts the 21-month sequenced curriculum that leads to a Bachelor of Science Degree in Medical Diagnostic Imaging. A year of the curriculum is dedicated to the supervised clinical experiences at one of FHSU's clinical partners. The program is comprised of 22 clinical hours and 33 hours of didactic study. Prospective students are encouraged to visit the campus and tour the program to decide if the course of study is appropriate for them. Arkansas State University-Main Campus has grown considerably from the agricultural school founded in downtown Jonesboro on April 1, 1909. The university has a current enrollment of 13,144, including 800 students hailing from a dozen countries. It recently received a $20 million gift from the Reynolds Foundation for a Reynolds Center for Health Sciences. Radiologic Sciences Programs were established in 1981 and currently offers seven specialty tracks leading to a four-year degree in Medical Imaging and Radiation Sciences, Bachelor of Science in Radiologic Science (B.S.R.S.). Students must complete the radiography curriculum prior to entering a specialty track. Concordia University-Ann Arbor, founded in 1963, is a Lutheran university with a strong spiritual community. Its School of Science offers students a choice among 18 baccalaureates degree programs. Students entering the four-year program leading to the Bachelor of Science degree in Sonography spend their first two years taking didactic courses on campus. The final two years are dedicated to supervised clinical rounds at an approved area hospital. The program is unique in offering students a choice of six specialties: Abdominal sonography, Neurosonography, Vascular technology, Obstetric and Gynecologic sonography, Echocardiography, and Breast sonography. The College of Allied Health at the University of Oklahoma-Health Sciences Center offers eight bachelor degrees, five master's degrees, five doctorates, and one certificate program. More than 600 students are currently enrolled in Oklahoma City and Tulsa-based courses. The B.S. in Medical Imaging and Radiation Sciences – Sonography program begins in summer session. Students must complete 68 hours of didactic classes and clinical experiences to qualify for graduation. The college uniquely offers baccalaureate degrees in all four major disciplines: radiation therapy, nuclear medicine, sonography, and radiography. Applicants must have completed prerequisite studies in Algebra, anatomy, physiology, mathematics, psychology and chemistry. The Diagnostic Ultrasound and Vascular Technology program at the University of Kansas is offered at the KU Medical Center campus, established in 1906. The 18-month program is conducted over five consecutive semesters and leads to a clinical certificate. Applicants must be a registered radiologic technologist (ARRT). Students who complete the curriculum may take the national board examination offered by the American Registry of Diagnostic Medical Sonographers (ARDMS). Students serve a clinical internship in conjunction with didactic studies for all five semesters of the program to prepare for employment as a sonographer and vascular technologist. Founded in 1950 as an expansion of the system's Fairbanks campus, the University of Alaska Anchorage has become the state's largest university with satellite campuses serving the communities of Mat-Su, Homer, Valdez, Kodiak, and Soldotna. UAA's 72-credit Associate of Applied Science Degree in Diagnostic Medical Sonography (DMS) takes from three to five years to complete on a full-time basis. The program length is determined by whether the student has completed prerequisite courses. Major studies include courses in abdominal, OB/GYN, breast and vascular sonography. In the final year, students undertake 26 class hours in a clinical practicum setting. For 50 years, Kettering College has provided students with a wide range of health care educational options. Today Kettering offers 8 degrees in healthcare specialties serving more than 700 students. Programs are designed to provide students with hands-on experience, facilitated by an exceptional 9:1 student/faculty ratio. The Bachelor of Science in Diagnostic Medical Sonography program provides specialized sonography training in abdomen, echocardiography, vascular technology and obstetrics/gynecology imaging. Students complete prerequisite coursework in their first year. The degree program culminates in a clinical internship, capstone project and registry review to prepare for national examinations. The founding of the School of Health Professions at Rutgers University-Newark represents the latest academic and vocational programs to be developed in conjunction with Rutgers' Biomedical and Health Sciences. Located on Scotch Plains campus, the Diagnostic Medical Sonography Program is a full-time, 15-month program dedicated to education in obstetrical, gynecological, abdominal, and neonatal/neurosonography ultrasound. Students can choose from programs leading to undergraduate and post-baccalaureate certificates, and a Bachelor of Science in Medical Imaging Sciences completion degree. Of the 45 credits required for completion, students take 1400 hours of supervised clinical practice. For 2016, Grand Valley State University offers its 25,000 students comprehensive academic and vocational programs leading to 87 undergraduate degrees and 37 degrees at the graduate level. The diagnostic medical sonography (DMS) program begins a cohort class every fall with didactic and clinical instruction leading to a Bachelor of Science degree. Admission to the program is competitive and applicants are required to have completed two years of post secondary general education courses. Students are placed in four distinct rotating clinical settings to allow for experiences in serving a diverse population. There are 35 credits required in DMS general prerequisites. Students seeking a Diagnostic Medical Sonography Program will have the opportunity to gain professional experience at the Thomas Jefferson University. Students will learn how to gather necessary images and work efficiently in a technical environment. Students will also gain oral and written communication skills through the program. The option for dual concentration is offered at the university and students are able to choose general sonography. General sonography can be taken in combination with cardiac sonography and vascular sonography. The campus provides various services for students. The option to stay healthy is accommodated by the university's health and wellness services, and students can get involved on campus through the office of student life and engagement. Students must weigh many factors when selecting the ultrasound technician school that is best equipped to meet their needs, including cost, location, acceptance rate, and school type. Use our school comparison tool to narrow down your options based on these criteria to get tailored list of ultrasound technician schools near you. Professional certifications can help ultrasound techs market their skills to employers. Learn more about getting certified. Aspiring ultrasound technicians can browse this listing of financial aid and scholarships opportunities to help pay for school. The field of medical sonography offers ample opportunity for career growth. This guide outlines several pathways for advancing your career. This guide provides a wealth of resources for students looking to make the most of their time in ultrasound tech school. Is Ultrasound Technician School Right for You? While ultrasound technician education programs are typically shorter than other professional training options, potential students still want to make sure it’s a good fit for them before committing to a school or program. This quiz is designed to help those on the fence to figure out if ultrasound technician school is right for them. Do you want the ability to work hands-on with patients without years of additional education? Is the thought of not being at a desk all day appealing to you? Would you like the ability to work in several different areas of care throughout your career? Is it important that your job isn’t just the same monotonous task day in and day out? Does the thought of being able to get started at your new job within two or so years? Would you enjoy working in a solitary environment without much interaction with patients or doctors? Is it important to have greater earning potential throughout your career? Are you averse to continuing education opportunities as you grow in your role? Ultrasound seems like a good fit! Based on your answers, it seems like you could be a great candidate for a career as an ultrasound technician. Your enjoyment of interacting with people will keep you energized at work, while the ability to start working quickly appeals to your ambitious attitude. While some of the facets of a career in ultrasound technology are appealing to you, this may not be the best fit. There are lots of similar jobs within the medical profession you may choose to consider, including roles as laboratory technicians or MRI technologists. 1The transducer is the device that sends high-frequency sound waves into the body. 5Based on distances and different types of echoes, the machine is able to project a two-dimensional image of what is inside the body. Educational options are varied for prospective ultrasound technicians, with programs ranging from the certificate to bachelor’s level for the majority of jobs and advanced degrees for individuals looking to work in research, teaching or advanced methods. The following section provides an overview of program requirements, common completion times, prerequisites, and examples of different types of schools offering the range of programs and degrees. Prerequisites: The majority of programs require students to hold a high school diploma or GED. Option 1: Graduates of accredited certificate programs are eligible to begin working after completing their exams, meaning they could begin their careers as an ultrasound technician straight after school. Option 2: Individuals with a certificate may decide they want to pursue higher education, such as an associate or bachelor’s degree, and work in more advanced roles after a time. Prerequisites: Most programs require candidates to have a high school diploma or GED for admission. Option 1:Students with an associate degree in medical sonography can start working as ultrasound technologists right away. Many graduates choose to pursue certifications through the ARDMS or ARRT to improve their career prospects. Option 2:Aspirational graduates likely already have their eye on ways to advance their careers, and gaining a bachelor’s degree is a great option. These four-year programs enable students to take on supervisory roles in ultrasound. Time to complete: Some programs are full, four-year degrees while others are professional programs designed for students who have already completed prerequisites before applying. These typically take between two-and-a-half and three years of full-time study. Prerequisites: For four-year bachelor’s programs, students need a high school diploma or GED, and generally must meet high school GPA and standardized test score requirements. Professional bachelor’s completion programs accept students who have already earned an associate degree in medical sonography. Option 1:While it’s still possible to work as an ultrasound technician, many graduates with a bachelor’s degree in ultrasound technology have their sights set on senior-level roles working in research, operations, or as managers of other technicians. Option 2:A master’s degree is an excellent next step for individuals who may want to teach or serve as the lead sonographer for a large hospital or specialty practice. Students with a bachelor’s degree can gain their master’s in one to two years of full-time study. This path opens up further career options, including specialized sonography skills in areas of pediatrics and cardiac care. Graduates are also able to teach medical sonography once they hold a master’s degree. The PhD is typically offered as a Doctor of Philosophy in Advanced Diagnostic Radiology and allows graduates to work as ultrasound researchers or in the field of radiology. Once a master’s degree in ultrasound has been completed, this degree can be achieved with one to two years of full-time study. With so many options out there, finding an ultrasound technology program suited to a student’s individual needs is paramount. Some students may need the flexibility of an online program to fit classes into their busy schedules, while others may know they learn best sitting in a traditional classroom led by a professor. The following list of tips is designed to help students figure out which components of an ultrasound technician program are most important to their needs. Educational programs or ultrasound technicians range from certificates to PhD and offer many different career paths, so it’s best to know which degree you’re looking to attain to ensure the program you choose has the right option. Many individuals complete their degrees while working, so finding a program that allows you to take classes online, or offers courses on nights or weekends will be crucial for the working student. Students want to learn from the best in the field, so they should seek out programs where faculty members have valuable and relevant experience. Programs where the majority of teachers completed their programs and moved straight into teaching means they won’t be able to share real-world experience of working with ultrasound technology. Like any education program, medical sonography certificates and degrees can be a significant financial investment. If money is a deciding factor, find programs that offer substantial scholarships or funding opportunities for students. One of the most telling factors of whether or not a program is successful is how their graduates fair after graduating. If there aren’t already alumni profiles on the website, consider emailing the administrator to find out about employment rates and places they are working. Because the field of medical sonography is expansive, students who want to focus their learning on specific areas – such as obstetrics or small parts – should make sure the program of their choosing allows them to specialize their knowledge. Aside from offering quick entry to a meaningful career path, certificate programs and degrees in ultrasound technology and medical sonography offer a wealth of advantages to graduates. Keep reading to find the ten key advantages of this field. According to the U.S. Bureau of Labor Statistics, the median wage for medical sonographers in 2015 was $69,970, while those in the top ten percent of earners received salaries close to $97,390. With the average American salary sitting at $36,000, this career field offers substantial financial perks. With more than 27,600 jobs expected to be added to an already expansive field, diagnostic medical sonographers can rest assured that the industry is stable and their jobs are secure. Medical sonographers are there for moments of great joy and anxiety, such as showing expectant parents the first glimpse of their child or helping identify cardiovascular irregularities. These professionals can derive great joy out of their work because they are constantly serving patients. Like other allied healthcare positions, medical sonographers enjoy flexibility within their schedules and many individuals who have other commitments outside their work – such as parents – find these roles attractive. Because sonography technology is used in many different areas of the medical world, professionals with these skills can work in numerous specialties within hospitals and physician’s offices. Although being trained as a medical sonographer takes less time than many other medical professions, individuals with a zeal for learning are drawn to this field because it is always evolving, requiring dedication to continuing education programs. Be it learning about new technology or seeking a higher degree, there’s always room to learn in ultrasound technology. Aside from interacting with patients on a daily basis, medical sonographers also work closely with many members of a patient’s medical team, allowing them to spend much of their days working with a variety of different people. No man is an island within the medical profession, and ultrasound technicians are vital and valuable members of a patient’s medical team. They work with doctors, nurses, and other professionals on a daily basis to provide professional images that help doctors create treatment plans. Because medical sonography is growing so rapidly, jobs are generally available throughout the country. Trained ultrasound technicians need not worry if they want to relocate to a different city – a job may well be waiting for them. Although work as a medical sonographer can be stressful at times, it’s also a rewarding career path allowing professionals to truly make a difference in the lives of their patients.